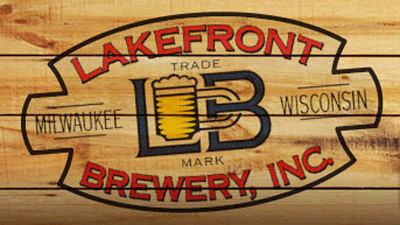 The unmistakable, lime green label of Lakefront’s IPA is ubiquitous in Milwaukee’s finer bars and restaurants, but as a neophyte beer drinker, I still remember it as the first microbrew that really made an impression on me. IPA remains one of my favorite beers. So, it is a huge hole in my hophead resume that I have never been to Lakefront Brewery for a tour. I’d only first gone there the year before for a fish fry charity event. When I saw a case of Lakefront beer and a private tour were a silent auction item, I had to win, and, eventually, after several other bidders stepped in, I made the winning bid – Michelle was okay with it because Lakefront also makes one of her favorite beers, Riverwest Stein, which is their most popular offering. A year later, prior to our ABCs of Milwaukee Dining brunch at Wolf Peach, Adam, Cindi, Michelle, Shannon, TJ and I made the trek to the brewery, which is, decidedly, not on the lake. Instead, it is tucked in the Milwaukee River basin, in the Riverwest district. 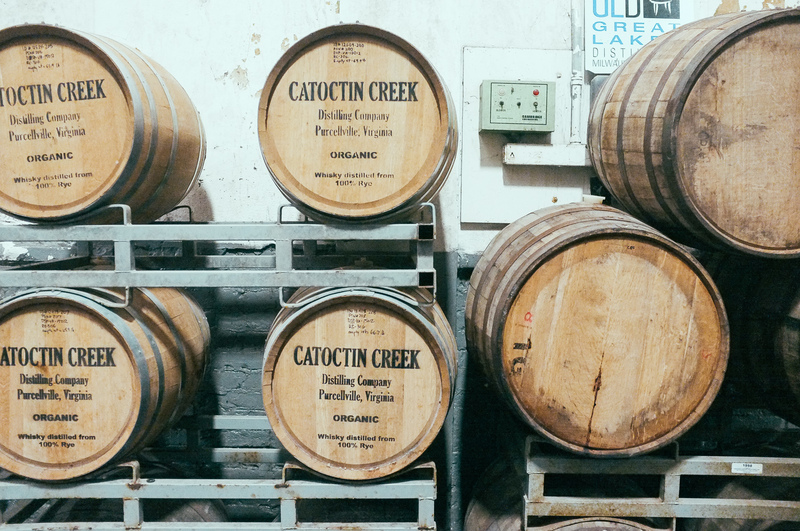 Normally, tickets are $7 per person, which is good for the tour, four six-ounce pours and a souvenir pint glass–this is a tremendous deal. Our tour was scheduled to begin at 10:30 a.m., while the general tours began at 11. While we waited for our group to arrive, those people on the next tour begun to show up, many of them wearing clothing bearing the logos of the college basketball teams that would be playing in the NCAA tournament later that day at the Bradley Center–including the Wisconsin Badgers. 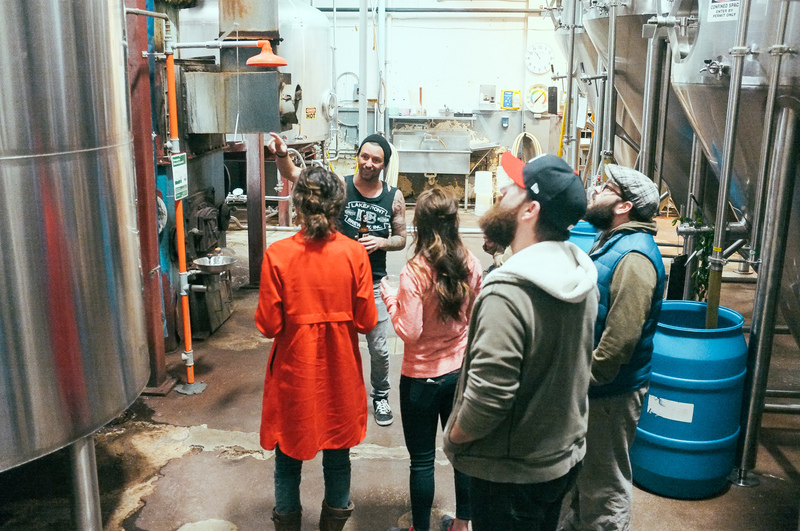 Our tour guide met us and the tour began how any great brewery tour should–with a glass of beer. I was excited to try the Bridge Burner–an imperial amber. It was pretty good. After that, we proceeded to the brewery floor, where we heard the interesting history of the brewery, which began as two brothers trying to out-brew each other. We learned that Lakefront was the first company to move into the now-bustling Beerline, home to condos, businesses and restaurants. 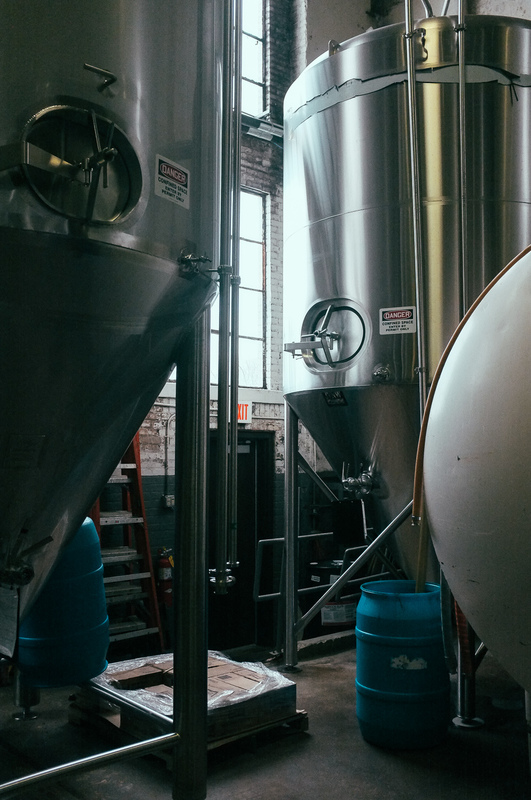 Amidst the towering fermentation tanks, with the smell of malt heavy in the air, we learned how Lakefront plans to continue their growth as Milwaukee’s most popular microbrewery. They purchased some land in the Menomonee Valley where they will erect a new brewery. 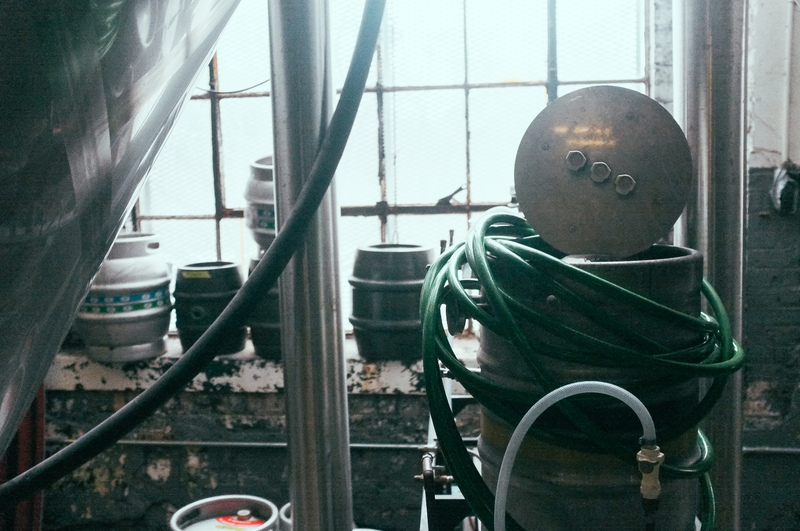 They plan to keep the current brewery open for tours and to brew their excellent speciality beers. 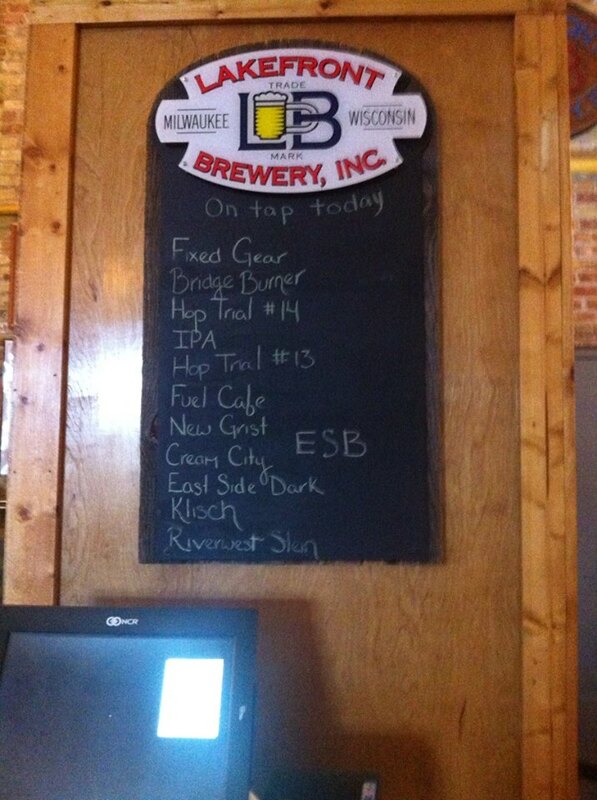 After another fill up – I tried the Bock, a seasonal, which was very tasty – we walked into the kegging area. There, our guide explained their preference for the kegs they used to use, which were sealed with a wooden bung–one of which was presented to Shannon. Apparently, every tour crowns a “bung queen” and Shannon was ours. The tour came to a close in the bottling area, where they played the Laverne and Shirley theme song. I enjoyed the private tour because we had the opportunity to ask a lot of questions and our tour guide was incredibly knowledgeable and a lot of fun. Then we proceed back to the large, lively beer hall and enjoyed more beer along with reasonably priced – and much needed – cheese curds and pretzels. With my other tokens, I was excited to try their two “Hop Trials,” #13 and #14. Our guide explained that they were trying to make a session IPA, and these were their latest attempts. They were both excellent. 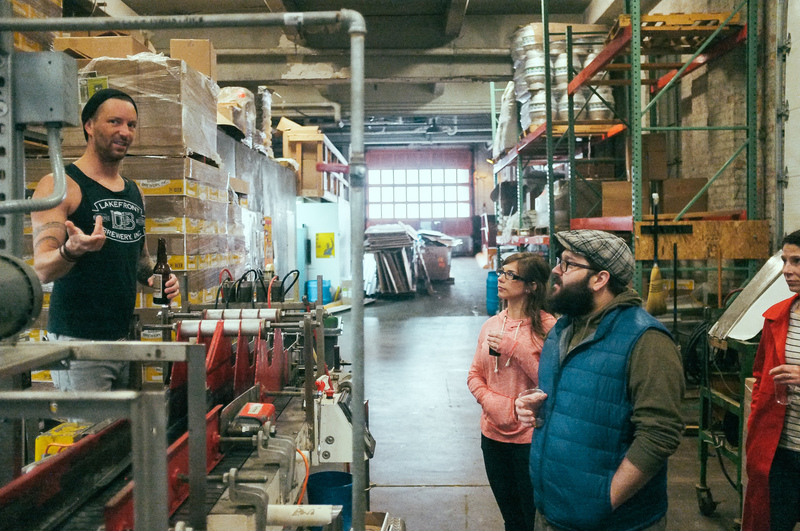 I respected Lakefront for the excellence of their beer prior to ever going on the tour, but after seeing their love of fun, beer and Milwaukee, I know I’ll think fondly of the tour and the brewery whenever I pop the cap off a Lakefront beer. Visit Lakefront online and book your tour here. 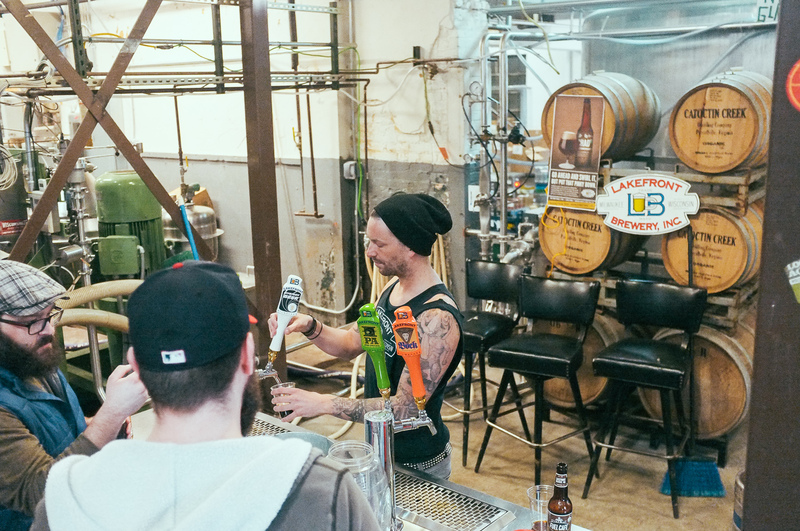 Photos, except for the beer list, by TJ UTTKE PHOTOGRAPHY.